I have been meaning to post this for a few weeks now. It’s so late but so cute, I just have to post it anyway. 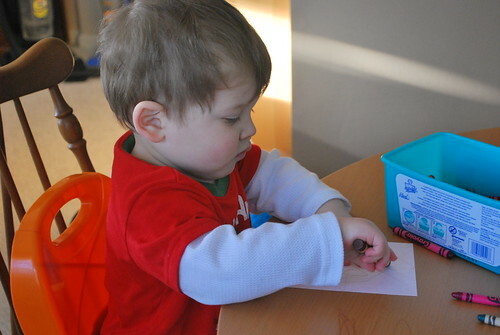 When were stuck in the house due to SnOMG!, I was trying to come up with some activities to keep E busy. 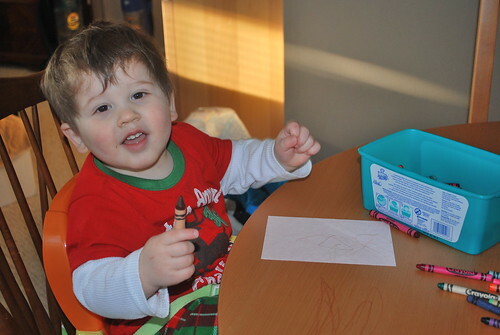 He loves doing crafts so we ended up doing a lot of coloring and painting. 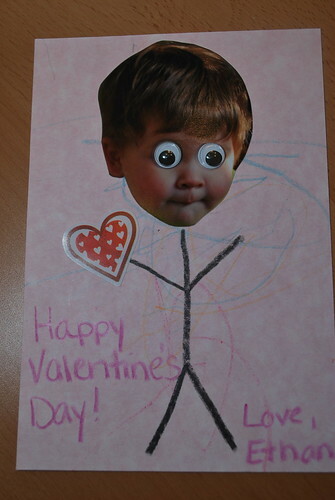 Since Valentine’s Day was right around the corner, I had him make some Valentines for our family. I dug out my old scrapbooking supplies and some crayons and away we went. Are these not the cutest things ever? I have this one hanging in my cubicle. Whenever I need a little chuckle (which is way too often), I look over at it and smile. 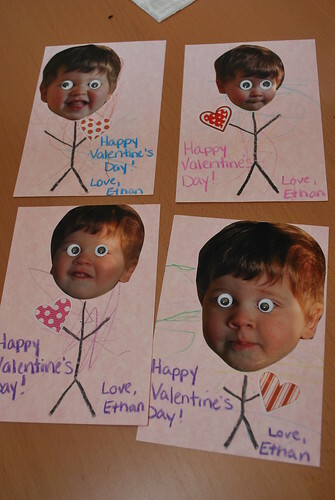 We handed them out to family on Valentine’s Day and they were a big hit! « i heart faces ~ "Hands On"
Oh my. These are. You are a creative momma!!! That pic reminds me of the Christmas special Kris Kringle…it looks just like him. LOL! It reminds me of a funny picture of myself from a few years ago when I worked Vacation Bible School at my church. Maybe one of these days I will post it. Ya'all would love it! Those are so darn cute!!! I love the eyes, hehe!